The design world has undoubtedly become more competitive over the last decade. Clients have the opportunity to outsource their work to anywhere in the world and therefore are looking for added value when they are doing business with you. Whether you are introducing designs for a new business logo, new WordPress website, or a complete corporate package, you need to go about it the right way. Face-to-face or over the Internet? You have to make the choice whether you are going to present your design ideas face-to-face or over the Internet, and then get the presentation tools that you need. It may be that you do several presentations over the Internet with bigger milestone presentations face-to-face. The face-to-face contact is part of your added value. It is an opportunity to interact in a rich way and really communicate the reason behind what you’ve done and the decisions you have made. The decision on this will dictate the medium of your presentation. If you are inviting clients to your office then you should have quality presentation systems in order to enhance the power of what you are communicating. If you are presenting online then make sure you do so in a collaborative environment through quality cloud-based software. 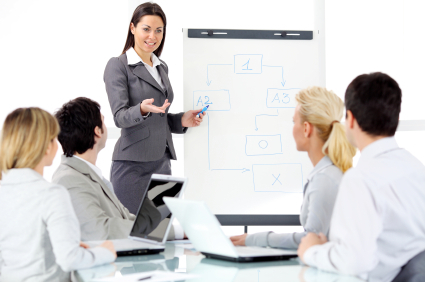 In any meeting you need to communicate that you have done your research. You need to make sure that the client understands that you understand their objectives and their philosophy. Why did you choose to use the colour red? Did you intentionally make the font small on that flyer? Why did you choose curves rather than angular lines? Why is this so much information below the fold of the homepage? Questions are a sign of interest and should not be feared. However, you need to make sure that you have valid answers to these very good questions. How does what you have done it into what they are trying to achieve? When you are presenting designs you need to make sure you are telling the story. This story will provide frames of reference for all the details of your designs. Read up about the art of telling a story, and practice. You need to of course make sure the story is intimately entwined with the brand for which you are designing, and the story that they are already telling. One great story to tell is by focusing on the problem and then providing a solution, and highlighting how each aspect of your designs solves an aspect of the problem. Another story philosophy is to look at the design lifestyle chronologically in order to highlight the steps that you took to get to where you are now.